Probably the biggest problem that I have with Romm, however, is that he appears to suffer from acute cognitive dissonance. For example, the overriding theme of his blog is one of impending climate doom, yet he regularly proclaims that renewables are already at grid parity, getting cheaper by the second and ready for mass deployment. So, problem solved surely? Frustratingly, this is a recurrent theme on many green blogs, where Cassandra complexes are hard to square with wildly overstated -- or misleading at best -- claims about current renewable energy performance. 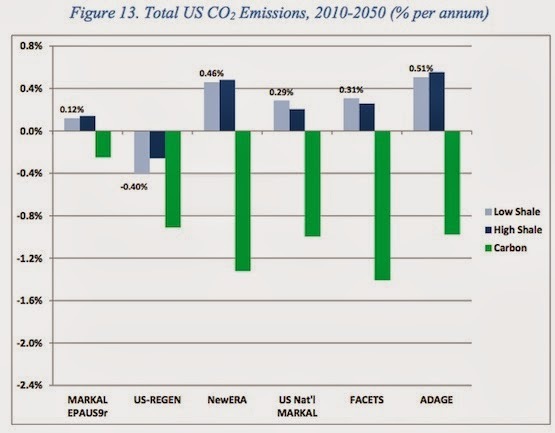 …this trend towards reducing emissions becomes less pronounced as natural gas begins to displace nuclear and renewable energy that would have been used otherwise in new power plants under reference case conditions. Another contributor to the modest emissions impact is the somewhat higher economic growth that stimulates more emissions. Reinforcing this trend is the greater fuel and power consumption resulting from lower natural gas and electricity prices. Does anyone else see the irony here? Romm is lauding a study which questions the climate credentials of shale gas... and yet that largely depends on whether cheap gas displaces nuclear power -- a technology that he maligns at every opportunity. Comparison of low shale scenario (light blue), high shale scenario (dark blue), and a scenario depicting a reference case combined with a carbon price (green). This reference case is in between the low and high shale scenarios, while the carbon price starts at $25/tonne in 2013 and increases at 5% each year. Source: Huntington et al. (2013). 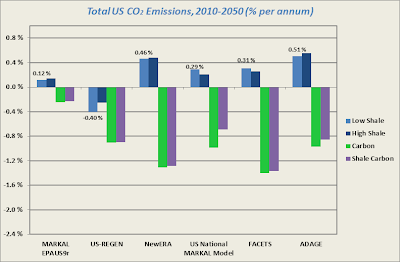 The dramatic reduction in emissions due to a carbon price is clearly evident. However, the above figure is still not really comparing apples with apples, since the carbon price is not adapted to the high shale scenario. (It is applied to a reference scenario that is somewhere in between the high and low shale cases.) Luckily, the data that would allow us to make the correct comparison is available here. I have therefore reconstructed the above graph, this time adding a new column that specifically combines the high shale scenario with a carbon price. Based on Figure 13 of Huntington et al. (2013). 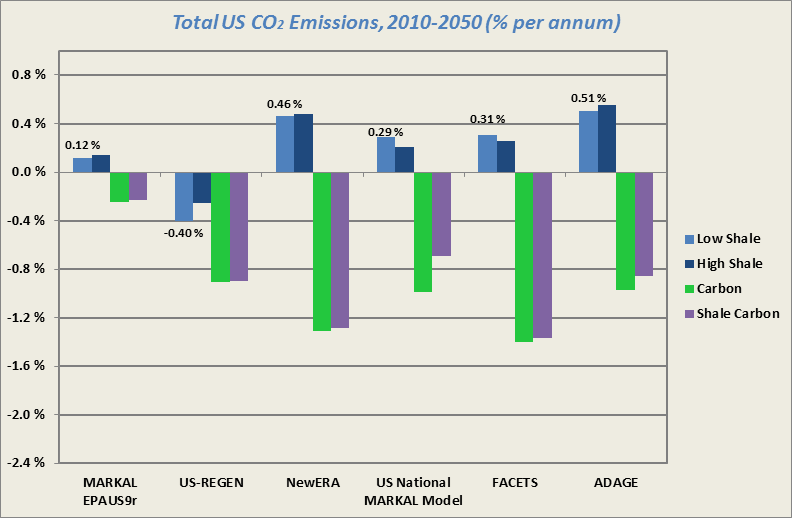 The figure now includes a fourth column (purple) where a high shale scenario is combined with a carbon price. This updated graph makes perfectly clear that the shale revolution can be fully compatible with deep long-term emission reductions, as long as it is complemented by a carbon price. To his credit, Romm does mention this briefly in the article and has also commented on the issue previously. Yet, by continuing to disparage shale gas and pretend that its supporters ignore the need for a carbon price, he simply serves to further polarise the climate debate. THOUGHT FOR THE DAY: Adapting to the threat of climate change will require a broad suite of interventions. Nobody should claim that the proliferation of shale gas is a sufficient development for de-carbonising the global economy. However, together with a carbon price and other technological breakthroughs, it will likely form a very necessary component. Higher shale resources reduce the costs of natural gas development and expand opportunities throughout the economy. Relative to its path in the low-shale case, [real GDP] is higher in all models that track the economy’s aggregate output. The cumulative aggregation of these GDP gains over all years is significant standing at $1.1 trillion (2010 dollars). Showing this in graphical form is a little trickier, since some of the models actually take economic growth as an exogenous assumption, or don't extend all the way until 2050. 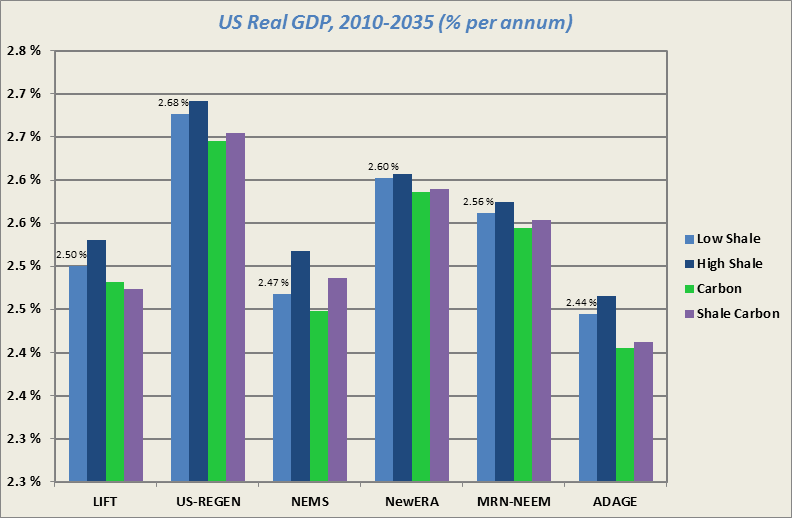 Nonetheless, here is a graph showing a selection of models that compare changes in real GDP up until 2035.